Epicinium preview — Victory, at what price though? Why destroy the land you're trying to conquer? There’s an old expression, ‘Victory at all costs.’ But, does that mean forsaking the land in order to achieve conquest? 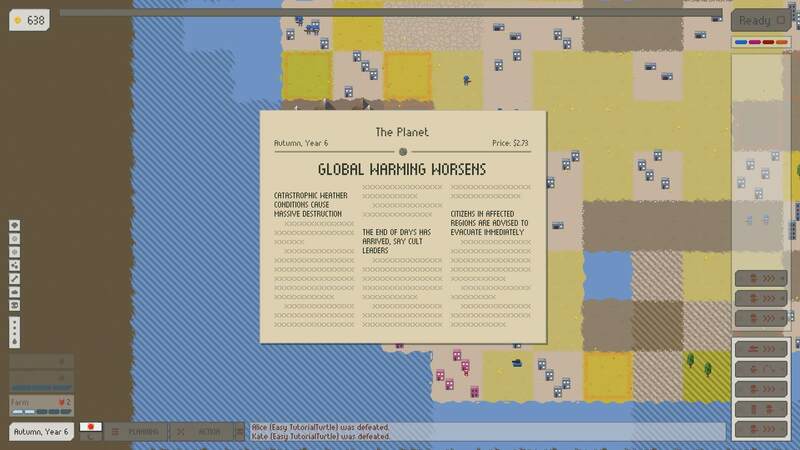 Epicinium is a turn-based strategy game that asks exactly that question. 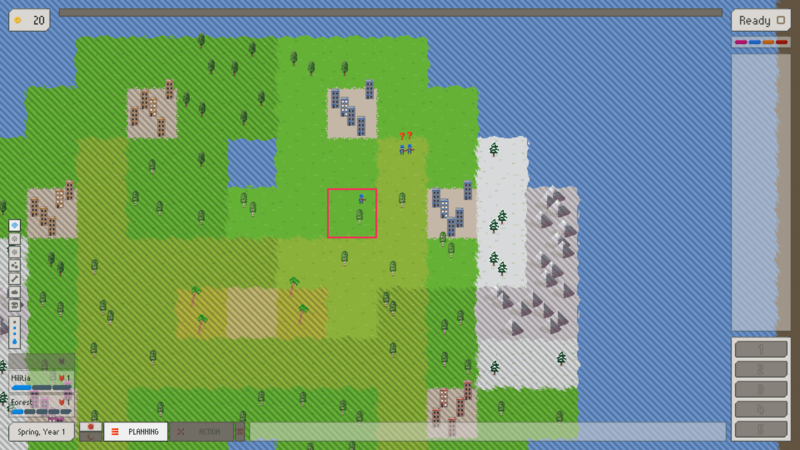 In Epicinium, no matter how many opponents you have defeated, your final score is determined by how many forest and grass tiles remain on the map. I’m really good at defeating enemies. I’m really bad at keeping the land intact while doing so. I believe my ‘high’ score was a whopping fifty-four. My last game was against three enemies… oh, I won alright, but with a score of seven. Yeah, seven. You start Epicinium with a couple of cities, twenty dollars and usually two militia units. I’ve been lucky enough to start with three militia a couple of times. 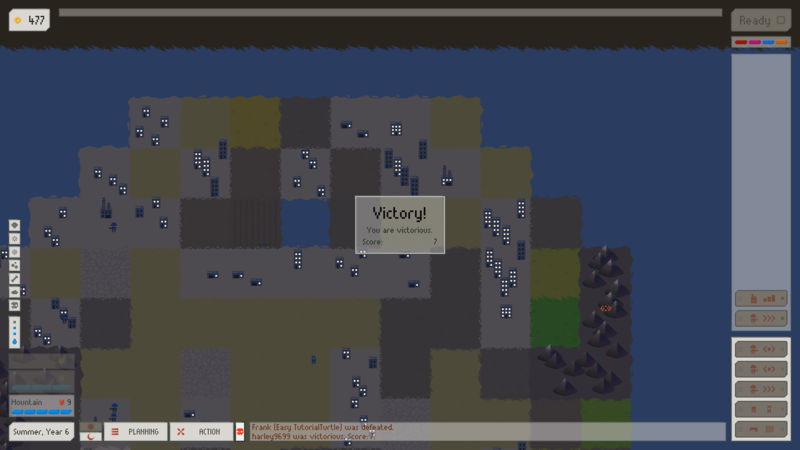 Your towns can produce a settler, a riflemen squad, barracks or a factory. The settler is a very versatile unit. With it, you can settle a town, settle a city or settle a farm. 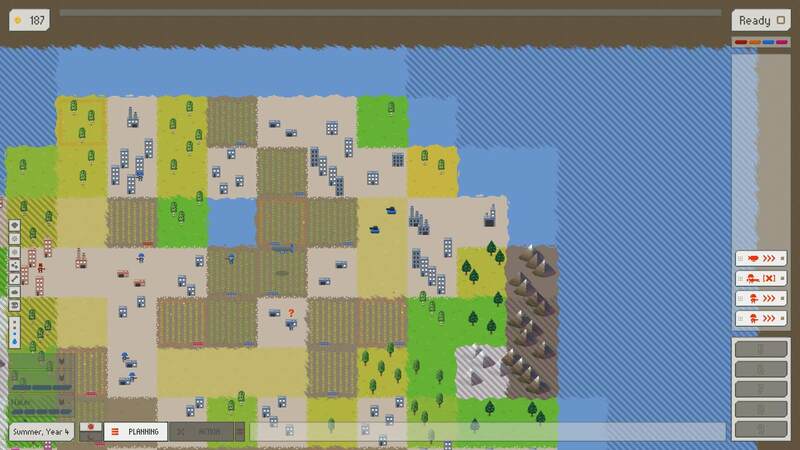 When you decide to make a farm, it will cultivate crops in all nine squares around and including itself — provided there’s grass and no obstacles such as mountains, a town, city, etc. At night is when you earn your money. Buildings gain power and make cash, but cities only will generate the bucks if enough grass, forest, water and crops are close. You’ll know what’s working because little coins will pop up from everything which is making money. Riflemen are your main infantry troops in Epicinium. They’re best used for capturing enemy structures. However, they are also fighters. Like most of your offensive forces, they will automatically attack enemy units they run across. If attacked, they will fire back. Also, they’ll shoot any unit that moves away from them. Finally, they have the ability to focus fire on a specific hex, (presumably) increasing the damage dealt. By the way, combat destroys grass and crops. About to capture enemy property. Barracks are used to produce a couple of other types of units — the sapper, which can bombard enemies at a distance and gunners, who also have focus fire, but can also build trenches. Barracks are also capable of building riflemen, but at half the cost of a city that does (five dollars instead of ten). Finally, Barracks can upgrade themselves. Gunner, right out of the barracks. Factories are mainly used to build tanks. However, they can also build airfields — which can later produce zeppelins and factories too, and have the ability to upgrade themselves. Factories then, produce the most harmful, (evil?) machines toward the Epicinium environment. (Remember, you’re trying to preserve this.) As tanks roll across the land, they destroy everything in their path — grass, trees, crops, etc. These things are all of the items which you’re wanting in order to keep your score high in the end. Zeppelins are peaceful enough though, right? No. Their sole purpose is to drop gas. Plunging gas down onto your enemies is not good for the environment, to say the least. For more fun, it spreads out for a while. Additionally, zeppelins can traverse places (water, mountains, etc.) which your troops can’t. Why spend all that time going around the mountain when you can just fly over it to bomb your foes? Ghastly, yes. The Planning Phase is obviously where you devise your actions. Epicinium adds some quite interesting wrinkles to this. First, is the timer. The default is sixty seconds. If you set it to one second, then it’s just AI vs. AI. There is a five-second option, but the ten-second one is already called ‘insane’. ‘120 seconds’ is ‘relaxed’. There’s also a ‘180 second’ option and an ‘off’, which equals no timer. The whole game is about anticipating what your opponents will do. Also during the planning phase, there are only five action slots, on the bottom right — limiting you to only being able to do five things, including moving, building new units or buildings, etc. However, if you plan a route for any of your personnel that will extend past a single turn, it’ll carry over the next turn and not count against your five. You’ve got to be pretty brave to plan routes longer than a turn and, a lot of times, into the fog of war. Then, if you change your mind and re-route or stop them, it does count against your five limit. Never knowing where the bad guys will show up certainly hinders ‘planning ahead’. 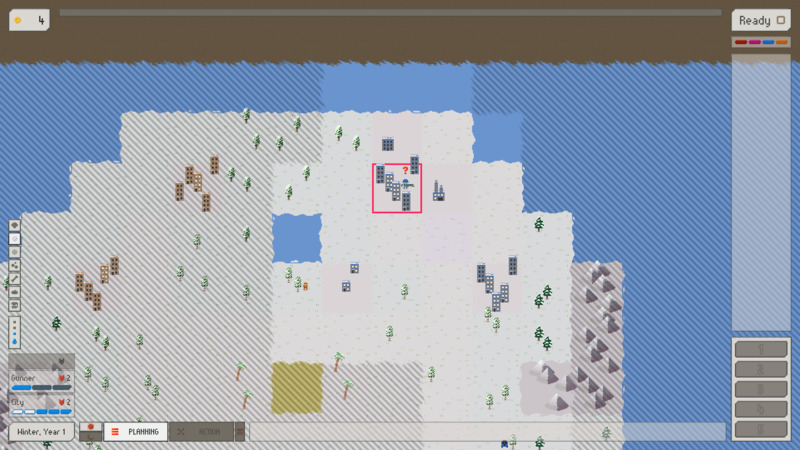 After a while, you’ve got four or five cities, maybe a dozen units… and you can do something… with five of them. On the bottom right, two units with previous orders above the five slot limit. The Action Phase is where all of the teams/factions move, build and shoot simultaneously. 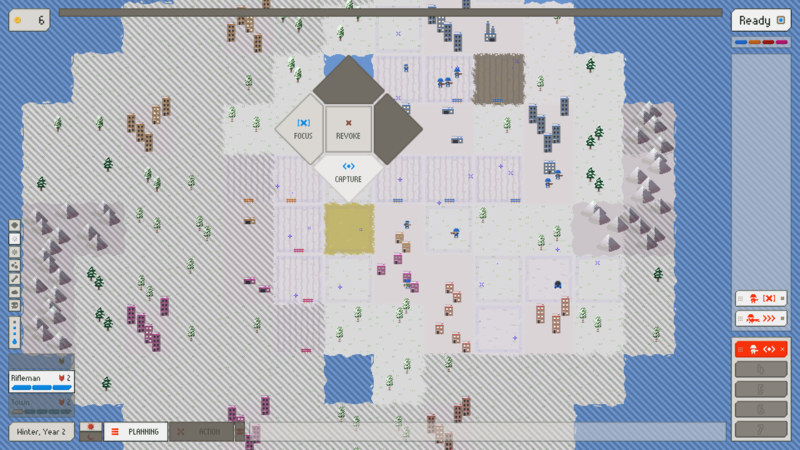 Units get built, troops get killed, buildings arise, buildings collapse (for a myriad of reasons), crops get both planted and destroyed — all in real time and without any way for you to interrupt any of the proceedings. That’s what all the planning was about, right? Depending on what you thought the enemy thought that you thought they were going to do — in a single turn, you can come out the hero… or look like a complete idiot. Having already mentioned day and night cycles, there can also be seasonal, as well as weather changes between turns. The worst (for me) is winter. Everything, as it should, moves a lot slower. The crops just sit there, while the troops trudge along at reduced speed. Finally, once a year, you suffer the effects of global warming. Epicinium’s global warming is brutal. 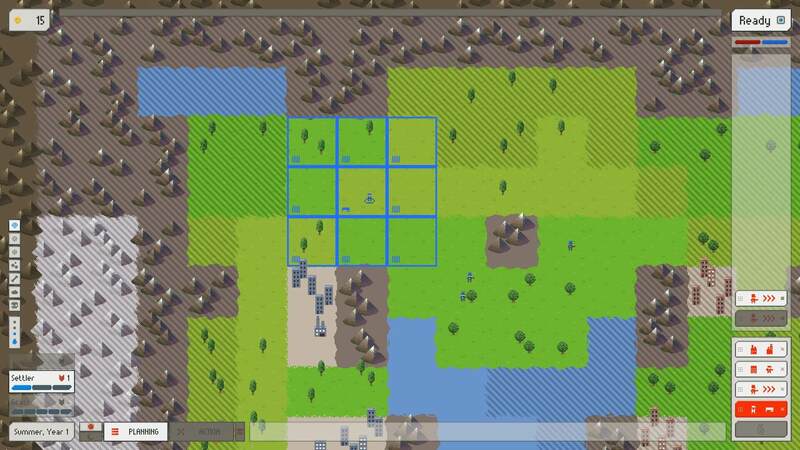 It randomly chooses squares to turn grass to dirt, take out crops, destroy trees and take out your hard-earned troops if they happen to be standing on that particular tile. Additionally, every year it gets worse. You’re already beating the surroundings with your combat and tanks, then the global warming event happens. By the end, your once green and grassy, crop-filled, trees aplenty land looks like, well… a battlefield. Note how terrible the land has become. As I mentioned in the beginning, your final score is calculated by how much land you didn’t destroy. Epicinium shows you in great detail the effect of war and global warming on the environment. Your environment, your land. Although you only started with a small piece of controlled land, if you don’t take it all over, your enemies will. By the end of the scenario, you’re left with a barren, dirt-filled world, almost without the ability to sustain life. You don’t always need blood and guts to demonstrate the horrors of war. Well, I did ‘win’, but notice the ground. Epicinium by A Bunch of Hacks is currently in Kickstarter with only a few days remaining, it is being developed for PC. I really hope they make it because I had a ton of fun, albeit tearing up the world — hence my puny scores. The last game against three opponents… I won — with a score of Two. Also, I’ve played ‘one-more-turn’ games all my life. Epicinium is different because I have to keep playing until the end — which means I have to play all the turns.